This is a place to buy and sell Volvo parts, not argue about their worth. I do see value in trying to stop price gouging on an unsuspecting buyer, but a) it's a slippery slope that leads to the violation of our #1 rule here at MVS: be a gentleman, and b) I don't see price gouging here, ever. If it's too expensive, don't buy it. Pretty simple. But please do not comment negatively on prices listed. Some of these posts are old. The forum stretches back over a decade now. Use your best judgement... generally a month is a good yardstick: if a topic's last reply was a month ago, chances are pretty good the seller has sold the item(s). Feel free to Private Message a seller under that circumstance, except if he has written that the item(s) are gone. Please price your car (we suggest the NADA guide for 1994 and later vehicles) on your ad - 'make offer' and the like is discouraged. If you need help pricing, see NADA or ask in the model's forum. This Forum is for Ads only - requests for pricing help should be posted in the appropriate Year/make/model Forum. Location, location, location. Please tell us where the car is in the world. Please click this button next to your post. If you're on mobile, it'll be in the "..." navigation element next to your post, and it'll say "Accept this answer." Please click that. It puts a green "check" mark next to the topic title and lets everyone know it has sold. I will not delete your listing after you sell your item(s), but I will lock it and write "SOLD" in the topic title. Just contact me. 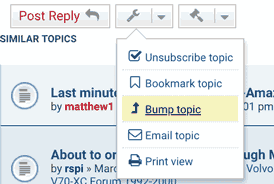 Bumping means posting to your thread or using the bump feature to make it "bump" to the top of the Classifieds. Please limit bumping to once every three days. That's the best frequency you may bump your For Sale post. MVS Contributors may bump once a day. Yep, change the price if you need to. We want you to sell the goods. Please don't abuse the bump rule by lowering a dollar every day etc. Adding parts numbers or additional thoughts may help you sell, and that's great. Please add those if you know them. The editing window for posts is currently set at four days, plenty of time for you to go back in and add what you need to. If it's outside this window, just post a new post to your topic. Keep the max number of posts to 2 per day. Please group multiple parts into one topic if it's for a single Volvo model or group. 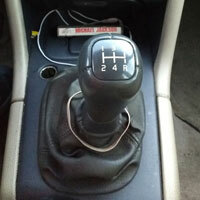 For instance if you're selling 5 parts from an 1998 V70 (P80), make one topic. If you're selling 5 parts from a 1998 V70 and 5 parts from a 2003 S60 (P2), make two topics. Last edited by matthew1 on Tue Feb 26, 2019 12:17 pm, edited 7 times in total. Hello, I just placed an ad the other day for my 2006 Volvo S60. It has been sold and I wanted to take down the ad I have on here. Any help? What is the etiquette regarding reposting local Craigslist ads that I see that might interest other users? I was thinking I could post the ad, listing any necessary data and then add a disclaimer that I am not associated with the vehicle or seller. It's a good idea. We actually started a topic recently that does just that... Volvos listed on CL or other sites. I might re-brand it from "Volvo Listings" to something else, more obvious. Also it could become its own sub-forum instead of a topic. But right now, there it is. hello everyone on the post,i'm ken and some partners bought a building a couple of months ago and its fill with all volvo parts. That being said, I don't really feel folks with 1 or 2 posts should be trying to sell vehicles from here. I don't think they should just come to buy from here either, but I'd imagine purchasers recognize the wealth of knowledge to be cleaned on here! Garagejournal (the tool forum site) has a protocol set in place where you aren't allowed to list tools for sale unless you have 100 posts. I think a 100 is a lot, but maybe we could have a 10-20 post minimum before being able to sell a car on here? theWIFES_S70 wrote: That being said, I don't really feel folks with 1 or 2 posts should be trying to sell vehicles from here. I don't think they should just come to buy from here either, but I'd imagine purchasers recognize the wealth of knowledge to be cleaned on here! I think making rules about 0 post users posting a car for sale would reduce the number of classified ads... and not much more. I lean toward having as "light" a hand as possible. A user's post count is right under their avatar, so there's no barrier keeping that info away from a buyer. Matthew- I have an acquaintance that is trying to sell a very tired V70 with a manual transmission for a reasonable price. He's been a lurker here an says he has issues with registering. Is it allowed to post an ad for someone else? Sure. Please have him contact me [email protected]. I'd like to follow up with the registration problem.